It seems like a lot of people have problems with editing objects. As it isn’t that hard, I decided to put together some things that are useful to know, when you want to edit objects. The scope for now is only the relativly simple editing you can do with only the trackeditor. I will not go into all the stuff that you can do with the object editor (like adding vertices, polygons and textures). This writing doesn’t have the intention of being complete or anything, so when there’s something you don’t understand or want to know more about, or just want to express your gratitude for this writing, please drop me a note, at m.p.j.keizer@sepa.tudelft.nl . This chapter is about the way a finished object is placed on your track. How to make a finished object will be discussed later. This figure gives the distance that the anchor of the object is placed from the centerline of the track. I don’t know the scale-values, but it seems like it’s the same as the ribbons. About 256 is the edge of the track. These values also seem to change when the trackwidth is changed, just like the ribbon- and fence distances. You can use both positive and negative values, where positive values are to the right of the track, and negatives are to the left. This figure determines the height of the anchor of the object, in relation to the tracksector it is placed in. A value of zero means it’s the same height as the tracksector. You can use both positive and negative values. With this value you can rotate an object round the Z-axis. The values are from 0 to 65535, so for a 180-degree turn (for instance when you want to show the backside of an advertisement), you use 32768. With this value, you rotate an object around it’s X-axis. Well, perhaps not it’s X-axis, but it’s a little vague in which order the rotations take place. Anyway, you can use this to rotate a grandstand in case the track is sloped, so that the grandstand is sloped in the same direction. .
With this value, you determine on which detail levels the object is visible. I think that it’s a "digital checkbox" format, but as the values aren’t worked out, I’ll just give a list of the "known ones". These can also be found in the trackeditor. These are, AFAIK, also the only values that are used on the original tracks. The "show before fences" perhaps needs a little explanation. Usually, the drawing order for GP2 is (back to forth) ribbons, objects, fences. But sometimes you want an object to be seen before the fences. A good example of this are the (300, 200, 100) signs that tell you when there’s a corner coming up. When you set the detaillevel to 148, you make sure the object is visible before the fences. So ofcourse you should also plcae the object before the fences then, as it will otherwise look like it’s leaking through. Ofcourse the object description needs to know to which object it should apply all this stuff. ID 2, used incase the Internal Object needs it. Some special internal objects require a second ID. An example for this is "internal object 5" (which is more of an external object, as it’s hardcoded in GP2.exe, and not in the trackfile). The original trees are all made like this: an object description points to "object 5", and with the ID2 is determined which textureID has to be used bu that object description. If you add 256 to ID2, you get the textureID that’s being used by that object description. That also means that you have to use texture ID’s in the range from 257 to 511 if you want to use them in an "object5" description. With this command you place an "object description" into the track. The first arg of 0x80 determines the offset into the tracksection, and the second one determines which object description is being used. Now that we know how to place objects around the track, it’s time to have a closer look at the internal objects. 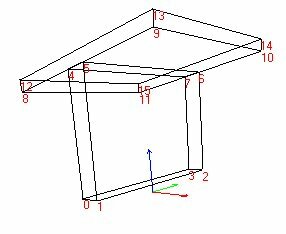 An internal object is defined by vertices, the lines between vertices, the polygons that these lines form, and the textures that are applied to these polygons. 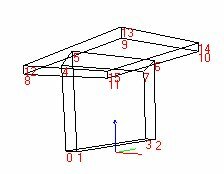 The vertices are defined by a X, a Y and a Z-value relative to the anchor of the object (which has coordinates(0,0,0). You can just enter a value for Z in the "points data" section in the TE of that object. For the X- and Y-axis however, things work a little differently. The advantage of programming the objects like this, is that you can easily stretch an object in one direction, by adjusting the "scale" value. 32768 to copy p(0)’s X and Y value. 32769 to copy p(1)’s X and Y value. 32770 to copy p(2)’s X and Y value. Sometimes, you want to "de-couple" points if you want to change the appearance of the objects. You can do this best in two steps: first, change the X and Y value of point(2) to the exact scales of point(0). Then, you can make the changes to the object, without worrying that changing point(0)’s position, changes point(2)’s position as well. Now that we defined the vertices, we have to make an object out of these. GP2 does that by making "lines" from one vertex to another. The definitions of these lines are in the "vertex connections list". These "lines" are then combined into "polygons", which are closed loops of "lines", running in one direction (so you can determine the sides of a polygon). Polygons in GP2 usually consists of 4, or 3 lines, but there are a few that use more (none less than three, ofcourse). For now, we don’t play around with the "vertex connection list", or the polygon definitions. A polygon has a texture applied to it. You can find these in the "texture data". Some textures have another entry except for the "texture ID", and these are repeat values (called "horizontal/vertical resolution"). With these, yoy can determine yourself how many textures you want to have side-by-side or above one-another on that polygon. For instance, on a pitbuilding, you want 16 pitstalls next to one-another, without having to create ne enormous texture with those 16 in it. 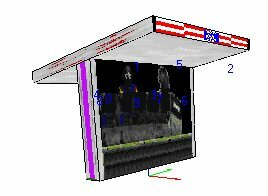 So you enter the texture ID of a pitstall, and enter a repeat value. You have to multiply the numberof repeats with 256, and enter that value in the box. So for 16 pitstalls, the value would become 256x16=4096. I'll do this step-by-step guide to changing an object, by means of an example. You know those pittents on Zandvoort, or Tunneltrack? Let me tell you how I made them. Choosing which base to use for your object is easily the most important step in the object-editing process. You want to go looking for an object that has the same "form" as yours. Nevermind the scales or the textures, these are easily changable. What is NOT changable (for us, now) is the way the polygones are glued together. So make that your main requirement when looking for an object. When it's a really complex object you wanne build (say, a castle, or a small chapel), it may be better to use more objects and stack them cleverly together on the track so it appears as one. So picture first what the desired object should look like. In this case, we basically need only need two boxes on top of one-another. The marshall-boxes that are used on Spa-Francorchamps (ID1=21) are just that, so that looks like a fine base. The next thing to do is to change the scale references. If needed, ofcours. 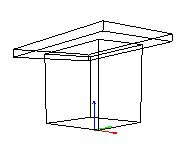 In this case, the two "boxes" are both "square", or: the X-axis uses the same scale as the Y-axis. We don't need that for the lower box, but for the upper one, it's fine. So some scales need to be changed on the lower box. Easiest is to change the Y-values of the points of the lower box to the same scale as those of the upper box, so that the lower box gets as wide as the upper one. By pressing "show points numbers" on the object-toolbar, we see that the lower box consistes of vertices (0,1,2,3) and (4,5,6,7), whereby the 2nd four points are coupled to the first four. That means, we only have to change the lower 4 points, and the uper four go with that automatically. So change the Y-values of Point(0,1,2,3) to scale 2 by replacing "4"s with "8"s , and "132"s with "136"s.
Now you see the basic form is OK. But the lower box is a little too fat. So just change scale0 from 343 to 64, gives it a much slimmer appearance.If you want to see the changes you made to the object instantanious, you just have to rotate the object slightly (click on the object and drag the mouse around). Because this scale value isn't being used anywhere else, the rest of the object is unchanged. 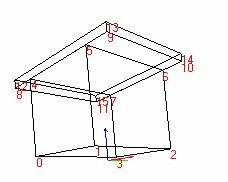 Take note that changing a scale to zero can cause some unwanted side-effects (like a total crash), so better change a scale value to "very little", like 8, if you want for instance to make a pointed roof on this tent. As one unit on the scale of the objects is very small, the difference between zero and eight is negligeble anyway. This would also be a good time to inform you of the fact that 1024 object-units is exactly as long as one tracklengthunit, which is in turn 16 "real" feet, which is 4.87 meters. That makes one objectunit equal to 4.75 millimeters, or for those who haven't learned metric yet: 3/16th of an inch or (if you like) 1/337684th of a mile. Note how neatly the connection is done.... math is beautiful, isn't it? As our object at this point still looks like a wooden shed, it's time for some new paint. I can't help you making good textures (just look at my tracks if you wonder why) so I can only tell you from the point onwards that this object is in your track and the JAM-IDs are all done. The JAM-tutorial will help you getting the textures and so on in your JAMs. You can look which entry in the texture data belongs to which polygone, by clicking on the "polygon numbers" button. It will put a number on all polygons and this number corresponds with the texture data. Somehow Paul still hasn't figured out it's impossible to read blue numbers on a blue background, so you'll have to rotate the object a little perhaps to read all numbers. You also need to rotate a little to see which number actually belongs to which polygon, as it's hard to see depths on a flat screen. This might also be a good time to give you a tip about rotating the object: when you press the "ctrl" key while rotating the object, it gets rotated only by the Z-axis, while when you rotate without pressing "ctrl", it rotates the object around the X and Y axis. Anyway, just change the number in the texture data to the ID# of the texture you desire there. You can check whether all the textures you have enteredfor that object are actually contained in the track, by clicking on the "fill objects" and "texture map objects" buttons. An unknown texture-ID is represented by a red/white blocked pattern. any questions you might have, can be put and answered here. version 0.8: initial release, where chapters 5, 6,7 are still blank.